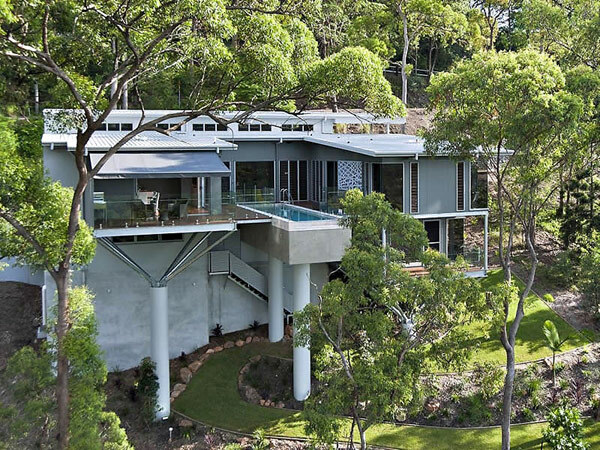 With an impressive modern architecture and featuring a swimming pool suspended 36 feet above the ground, Treetops Residence was designed by Australian studio Artas Architects & Planners and constructed by D Pearce Constructions. The building is located in Brisbane, Australia and is surrounded by a lush green landscape which ensures a high level of privacy. Here is more from the project developers: “The house’s centerpiece is a sky pool with living areas wrapped around its striking boldness creating a place of tranquility, where water, space and sky come together. The house cleverly and effortlessly fuses between separate, living and entertaining areas, parents retreat, office, children’s and guest areas.